Move the center of your universe to a country home in Theodosia and/or the Bull Shoals Lake area. You'll find that you can get anywhere from here, but you'll probably never want to leave. This custom built almost new one story over a full walk-out basement home is located on 3.7 acres of mostly wooded rolling land halfway between Gainesville and Theodosia. Bull Shoals Lake is ten minutes away. The setting is secluded and the view from the house and its large deck is beautiful. Each level has a bedroom and bath and the laundry set-up can be on either level. There is attractive wood siding and a steel roof, plus a 20' x 26' carport near the house. The open floor plan includes a vaulted ceiling to give a roomy feeling to the occupants. This custom built, over 1800 square foot, ranch style one level (over a crawl space) home enjoys a very private setting and is in move-in condition and awaiting your moving van or U-Haul truck. The builder/owner constructed it with low maintenance and low utility costs in mind, but has now decided to move back out west to live near his relatives during his remaining golden years. The large master bedroom is carpeted, but the rest of the home’s floor coverings are tile and wood (including bamboo). This 2 bedroom, 1 bath, one level, open-floor-plan home with a triple carport plus 3 sheds lies almost due north of the Spring Creek arm of Bull Shoals Lake. The Mark Twain National Forest is nearby, and the towns of Gainesville and Theodosia are each less than 9 miles away (in opposite directions). There are a private well and a private septic system here, plus another private well about a quarter mile east of the house where another home site with a great view sits. Most of this property is wooded and sloping. 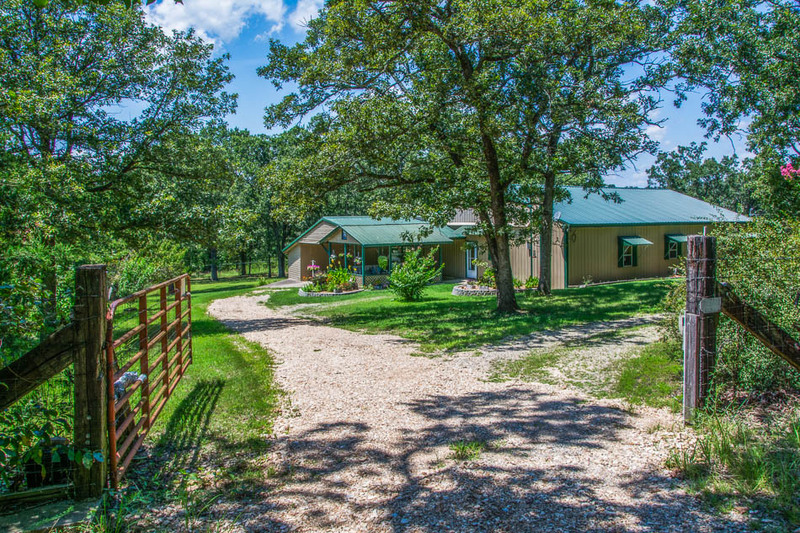 In the backwoods of Ozark County, not far north of Point 19 on Bull Shoals Lake, this home is nestled in the trees behind a gated road that leads in to it from County Road 655. That road enters Arkansas just to the south of this place, then dead-ends at the lake. The property is about 80% wooded. The open 20% includes a fenced-in 2 acres around the home and outbuildings, plus an airstrip for your ultralight aircraft. There’s a little spring-fed pond on this land, so lots of wildlife will be living here with you.